Representatives of countries that made up the "high-ambition coalition," which helped drive a global agreement in Paris last year, met in New York yesterday ahead of today's Paris Agreement signing ceremony. Photo courtesy of the E.U. Commission for Climate Change and Energy. NEW YORK -- U.N. Secretary-General Ban Ki-moon this morning declared the signing today of the Paris Agreement on climate change "a new covenant with the future." Addressing a crowded assembly at U.N. headquarters, Ban said leaders from a record 171 nations have gathered to officially sign onto the landmark deal. It is, he said, the largest number of countries to ever sign onto an international agreement on a single day. Secretary of State John Kerry will address the gathering shortly, as well as French President François Hollande and leaders from China, India and dozens of other nations. "We are breaking records in this chamber. But records have also been broken outside," Ban said. "Record global temperatures, record ice loss, record carbon levels in the atmosphere. We are in a race against time. I urge all countries to move quickly to join the agreement at the national level so the Paris Agreement can enter into force as early as possible." Environmental groups quickly heaped praise on the festivities but said the ceremony is the start of what will be decades of hard work. "We won't beat climate change with a piece of paper," Rhea Suh, president of the Natural Resources Defense Council, said in a statement. "We're leaving the age of Jurassic fuels behind -- for good -- and moving to cleaner, smarter ways to power our future." It's an event the United Nations has been shaping since leaders finished cheering the hard-fought completion of the Paris Agreement late last year. The first signs that midtown Manhattan was about to play host to an international ceremony of historic import came in the form of a security blockade that tied traffic around the United Nations' headquarters in knots for much of yesterday. Locals took a dim view. Said one cab driver: "If they can't fix the mess around the U.N., how can they fix the planet?" But planetary fixing was the order of the day inside the cordoned-off 18-acre complex on the East River, where preparations for today's signing of the landmark Paris climate agreement were underway. Parties participated in an all-day, high-level meeting on the United Nations' Sustainable Development Goals, which among other things seek to integrate climate and economic growth concerns. They conducted bilateral discussions with other countries. And they prepared for today's marquee ceremony that will see 160 world leaders, including Secretary of State John Kerry, arrive here to take a ceremonial victory lap after achieving the Paris Agreement last year. But countries with the most to lose from climate change were less concerned with today's fanfare -- an event some worried would lead to complacency -- and more concerned with immediate action to tighten the provisions of the Paris deal and realize its promises of aid and emissions reductions. "Getting a deal in Paris is not an excuse to rest on laurels," said Tony de Brum, who stepped down as foreign minister of the Marshall Islands after the December Paris summit. "We can reflect on what we have achieved, but it is much more important to start thinking about what to do next," he added. De Brum was instrumental in the creation of the "high-ambition coalition," a partnership of small island states, the European Union and other proponents of aggressive action that came to include the United States and Brazil. It emerged late in the Paris conference but succeeded in inserting language into the agreement creating an aspirational target of limiting post-industrial warming to 1.5 degrees Celsius. That's the limit vulnerable countries say would protect them from the worst impacts of climate change. 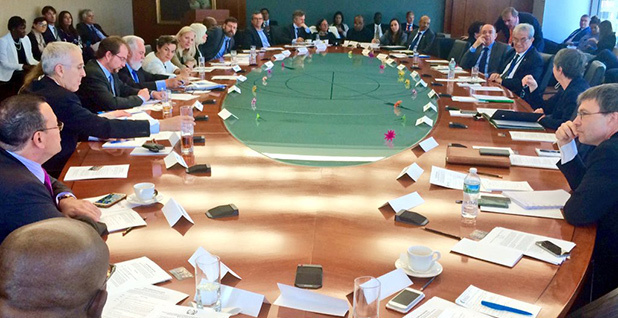 The coalition had a reunion of sorts yesterday afternoon at the United Nations, in which representatives from the United States, the Marshall Islands, St. Lucia, the Philippines, Gambia, Mexico, Colombia, France, the European Union, Germany, the United Kingdom and Ethiopia met to mull ratification for early entry into force and next steps for implementation of the deal. The United States was represented by new Special Envoy for Climate Change Jonathan Pershing, who spent part of the day meeting with "early ratifiers" -- a group of 10 countries, many of them island nations, that brought their adoption documents with them to New York and will formally join the agreement today. The deal will require 45 more members and a threshold of at least 55 percent of the world's emissions to take force, a goal that is beginning to look attainable this year. More countries will say this afternoon during a dedicated session what their timelines will be for formal acceptance of the deal. The coalition hosted advocates and three special guests yesterday: former Vice President Al Gore; Rachel Kyte, who serves as the U.N. secretary-general's special representative for Sustainable Energy for All; and former Irish President Mary Robinson, who urged help for developing countries in translating their pre-Paris commitments into action. In an interview before the meeting, de Brum said the group hoped to capitalize on the surge of momentum provided by today's event. "Like we say, a good, surfable wave should be caught and not just allowed to go past," he said. Island nations are seeing too many waves these days, as well as droughts, flooding and erosion, which threaten their existence. It's this impetus that made them come to New York ready to join the deal -- and hoping to spur other countries to do so at the same time. De Brum noted at an event hosted by Climate Analytics yesterday a few blocks from the U.N. campus that, historic as it may be, the Paris deal still sets the world on a path to see a temperature rise of 2.7 degrees Celsius -- a level he said would be "suicidal." Early ratification will help contain warming by preventing a lag in action, he said. But countries must also plan for more radical reductions in the midterm, as the United Kingdom and Germany have done in committing to become carbon neutral in the second half of this century. The United States and Canada will also unveil long-term decarbonization strategies this year. De Brum showed a willingness to hold his allies on the coalition to task yesterday, expressing disappointment that the European Union seemed to be preparing the world to expect its late entry into the deal. The European Union argues that it will take time for 28 countries and the European Parliament to ratify the deal, meaning the 12 percent of emissions it is responsible for will not be counted toward early entry into force until well into next year. De Brum said he would raise the issue during the afternoon meeting, adding that the European Union has moved quickly on other issues in the past and should again. The purpose of the meeting was in part to ensure that elections in various countries -- including his own Marshall Islands -- would not weaken the coalition's resolve to continue to strengthen international climate action. Asked about the election that will occur later this year in the United States, de Brum said he hoped it wouldn't undermine U.S. action, which is "essential." It was also very hard to come by. Proponents of an aggressive climate deal in Europe, South America, the islands and elsewhere would have preferred a treaty that included binding targets and offers of aid, but it would have required the approval of the U.S. Senate. "We did some very fancy ballet steps in making sure that the U.S. remained on board and signed onto Paris because of their own internal issues," said de Brum. "But we should not allow an election's convulsions to dictate what happens in the climate change space." There's some evidence that the United States might flip its stance if a Republican president succeeds Obama. Paul Bledsoe, a former Clinton White House climate aide and longtime observer of this process, said he was asked about likely scenarios by anxious Europeans. "I think the single greatest threat to the Paris Agreement today would be the election of a Republican president," he said. "That's certainly a subtext here in New York." On Tuesday, New York handed another primary victory to billionaire Donald Trump, who has dismissed as "inconceivable" the notion that climate change is the biggest problem facing the world today. Republican contenders Gov. John Kasich of Ohio and Sen. Ted Cruz of Texas would be unlikely to support the objectives of Paris, either. But for island nations, there is no such controversy. Warming, they say, is a direct assault not only on their property and resources but on their culture and national identity. Asked about the battles currently being waged in Washington, D.C., over the U.S. contribution to the Green Climate Fund, Thoriq Ibrahim, environment minister for the Maldives, said maybe lawmakers would benefit from a trip to his country. "Maybe those are very minor things when you sit on a big continent, a big country," he said. "But we take it very seriously, and it's very important for our survival. "Losing even 1 hectare of land is very important and very costly to get it back," he said. Besides losing land, the Maldives is also seeing its groundwater supply dwindle -- a trend that is especially dangerous and costly as its annual dry seasons lengthen and become more severe due to warming. Ibrahim remembers digging for water in his backyard as a boy, but since the tsunami of 2004, much of the island's water table has been contaminated with Indian Ocean salt water, and what is left is inadequate to supply the population during the three or so months each year without rainfall. The country is one of eight developing nations to receive the first grants of GCF funding and hopes to break ground on water storage and desalination facilities later this year. But Ibrahim said it is imperative that other island states have the same opportunity, and the money that rich countries have put forward so far is inadequate to meet those needs. Some environmental and climate justice groups say the Paris deal is inadequate overall, and a few have even urged poor countries to delay ratification -- rather than hurry it -- in order to gain leverage. Karen Orenstein of Friends of the Earth said in a statement yesterday that the assistance developed countries have offered to poor ones is "pitiful," especially stacked against "the euphoria surrounding the signing of the Paris Agreement." "Developed countries fell painfully short of their moral and legal obligation to provide money for developing countries to take climate action, in line with what science and justice demand," she said. "With the Paris Agreement, the world's poorest and most vulnerable got the short end of the stick, which is no cause for celebration." But Athena Ronquillo-Ballesteros of the World Resources Institute said early entry into force, together with implementation of the Paris Agreement, "is necessary to send strong signals to business and the investment community that in order to keep emissions below 1.5 degrees, we need a fundamental sector- and economywide shift in the way we meet our energy, transport and Infrastructure needs." Some observers fret that the United States might not meet its current obligations to Paris or expand on them after 2020, when U.S.-backed language calls for increasing ambition. But Leon Charles, a former veteran climate negotiator from Grenada, said at yesterday's Climate Analytics event that the "architecture" of Paris means that countries will be held accountable if they fall short of their targets. While the deal is often discussed in the United States as a political agreement with legally binding requirements on process and transparency, Charles painted it as "a legally binding treaty that contains some nonbinding obligations." "It's an international treaty under the Vienna Law of Treaties," he noted. Countries are "expected to deliver" their targets, he said, even though they are technically not binding. And while "nationally determined contributions" are put forward by countries, he noted that the deal provides that they be "informed" by the stock-taking sessions that will begin in 2023 and continue every five years. Countries that offer less than is determined to be their fair share, he said, will have to explain why. For those reasons, he called Paris "a strong progress in addressing what is a serious existential threat for us," again meaning small island states. Secretary-General Ban aimed to make today a moment to celebrate the deal reached on Dec. 12, 2015, after decades of wrangling over how to address climate change globally. But his climate change support team director, Selwin Hart, said at the same event that there was a risk the festivities would make parties complacent about the work still ahead. "In reality, Paris is just the beginning of a very long journey," he said. "The rules, processes and procedures that give effect to the long-term vision and ambition of the Paris Agreement now need to be developed." Ban, who will step down later this year, chose to make today a "major political event" not because the work is over, but as a reminder that more work will be needed to implement the deal and build upon it, he said. "Let's celebrate, let's be happy for what we achieved, but let's not be complacent," he said. Much of the work left to be done -- and the money yet to be invested -- must come from the private sector. Speaking yesterday at the United Nations, Governor of the Bank of England Mark Carney said that it's past time to overhaul the global financial system to attract low-carbon capital and improve corporate disclosure, telling listeners that regulators like him have roles to play. "We need to build a new system -- one that delivers sustainable investment flows, based on both resilient market-based, and robust bank-based, finance," Carney said. Yet in the wake of the 2008 financial meltdown, in which banks functioned in a "heads-I-win-tails-you-lose" atmosphere, people lost trust in market-based solutions, he said. Still, Carney said, market mechanisms remain the linchpin to attract "mainstream finance" and rein in greenhouse gas emissions with that investment. Climate change cannot be solved with financing from development banks, niche investors and public sources alone, he said. "With respect to climate, our role is to develop the frameworks for markets to adjust efficiently," the central banker said of regulators, reprising a speech he first gave in September. "With improved disclosure, climate skeptics and evangelists, techno-optimists and pessimists, alike will be able to back their convictions with capital." A recent report by the European Systemic Risk Board, established after the financial collapse eight years ago, found the average expected losses of global warming to be $4.5 trillion -- roughly the size of the Japanese economy.